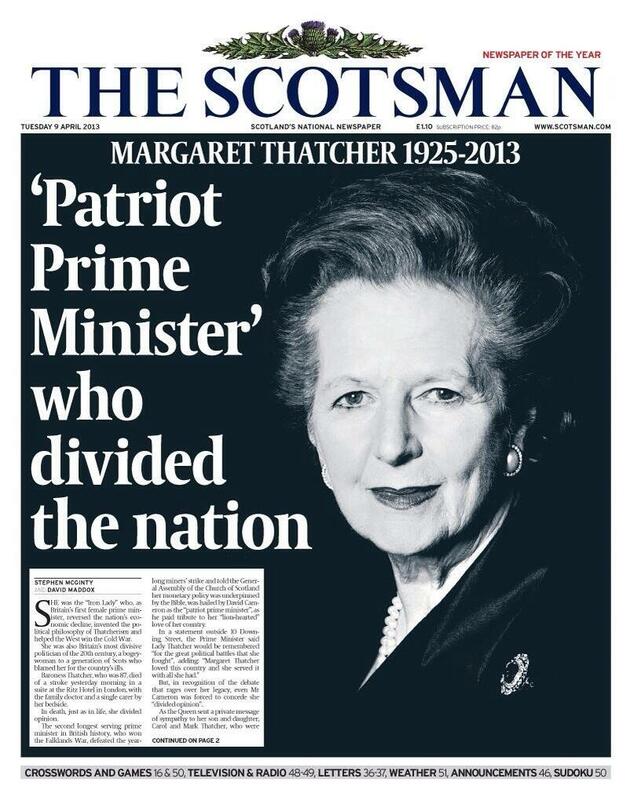 I never met Margaret Thatcher. She rarely came to the North-East, although there was one memorable walk in the wilderness in Teesside in 1987. I was meant to go to London to see her ... but fate, in the form of her resignation, intervened. 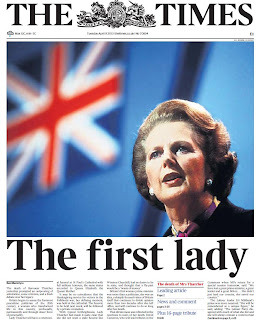 A lunch was due to be held at 10 Downing Street on November 23, 1990, and I had accepted the invitation. 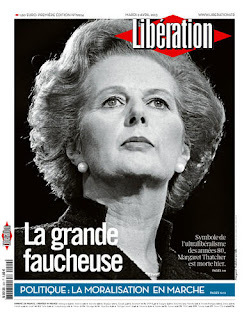 On the morning of November 22 she resigned. All the journalists at The Northern Echo came in early and we produced a lunchtime edition. 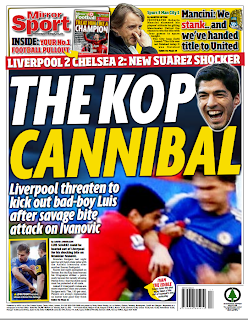 There was no commercial or sales rationale but it felt right editorially (those were the days). 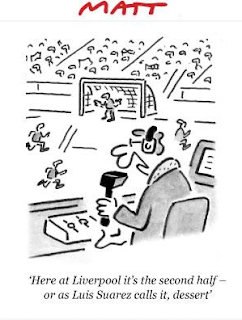 While I was on the floor drawing up pages, my secretary shouted over: 'Peter, Downing Street is on the phone for you.' 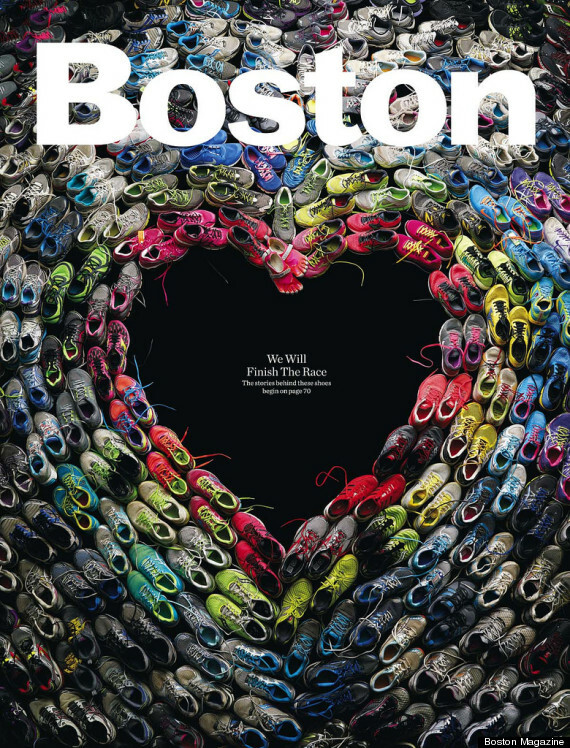 The newsroom's collective jaw - mine included - dropped. I picked up the phone, swiftly thinking of the questions I would ask during my world exclusive interview. 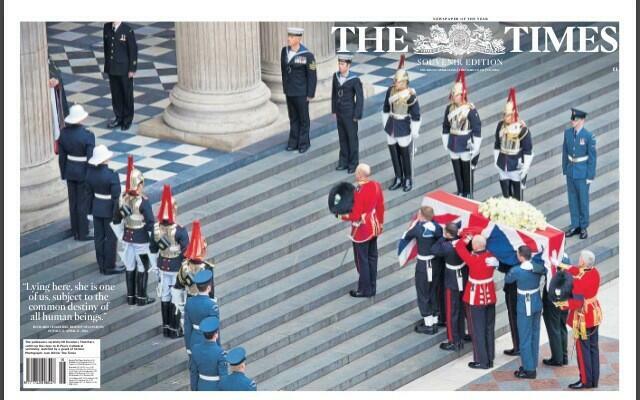 It was, of course, the appointments secretary to say, under the circumstances, tomorrow was cancelled. 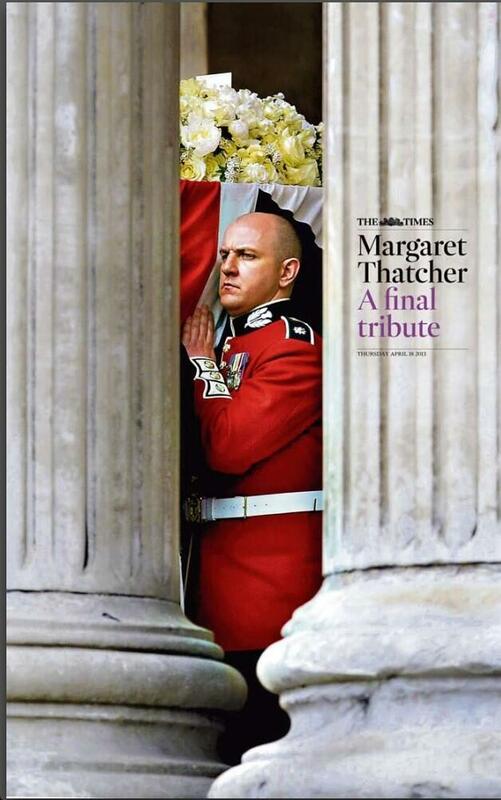 My successor at the Echo, David Kernek, who had previously been deputy editor and Parliamentary correspondent did, however, meet Mrs Thatcher several times. 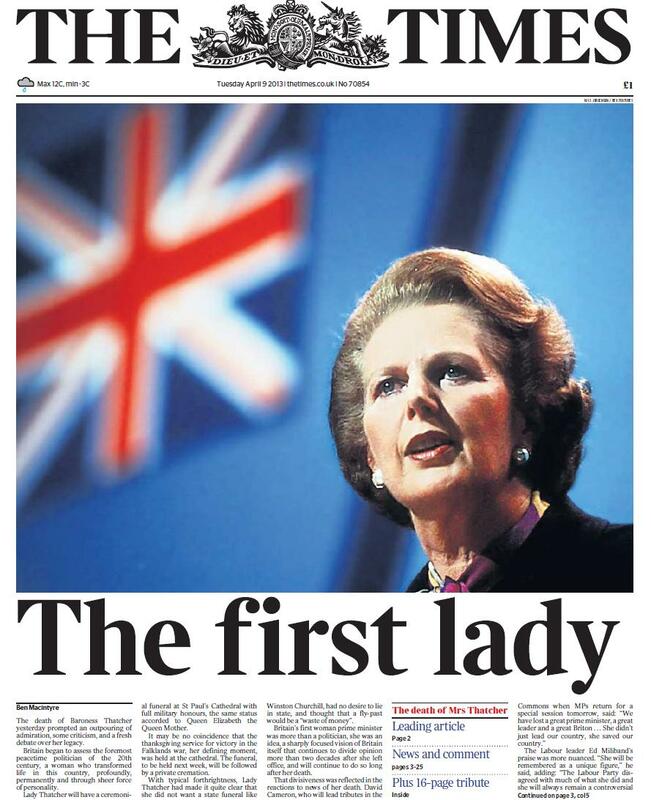 Today, as Britain's first female Prime Minister is laid to rest, he reflects on her tenure. 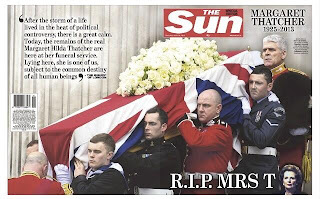 I will not be in London today for Mrs Thatcher’s state-funeral-in-all-but-name. 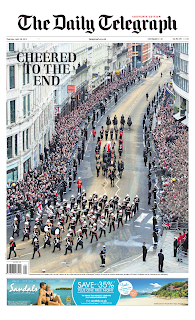 I won’t be inside St. Paul’s Cathedral – I haven’t been invited – and I won’t be outside with my back turned as the gun carriage pulls her coffin up Ludgate Hill. My encounters with her were brief and sharp –and to her, doubtless, unmemorable – but I saw no reason to hate her as one might with good reason abominate Hitler, Stalin or Pol Pot. The grocer’s daughter made much of her small-town, down home values, but Grantham was not a small town to which she returned frequently either during her working life or after it. In a message she sent to the town’s museum, she said: "From this town I have learned so much, and I am proud to be one of its citizens." Proud? If so, it was a pride she rarely demonstrated. The name of the school at which she was head girl was Kesteven and Grantham Girls' School. 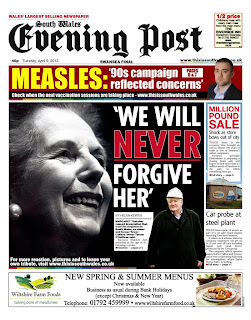 When she took her seat in the House of Lords, it was as the Baroness of Kesteven, not Grantham. Her constituency was in North London – one of the better-heeled parts – her country retreat was in Kent, and her post-PM decades were spent in Chelsea. There are people who arrange to die where they spent their childhood years. 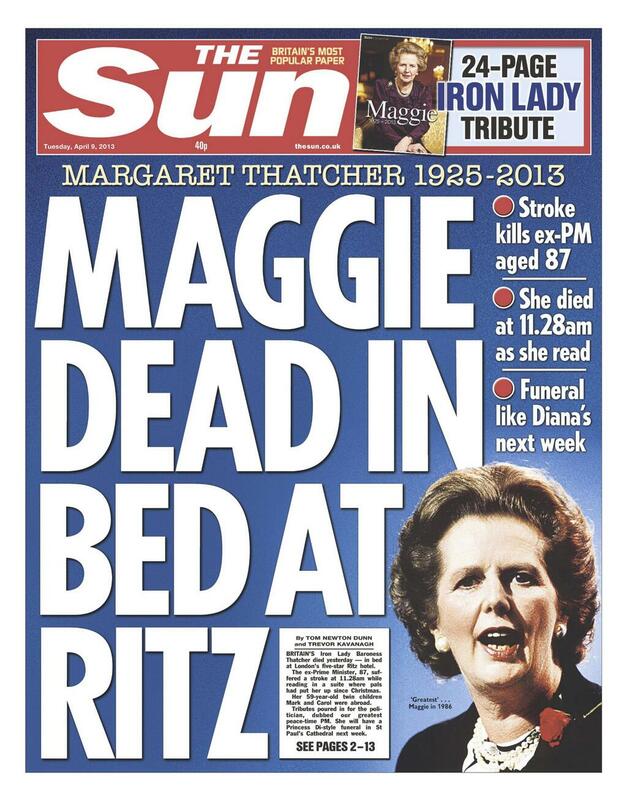 I wasn’t at all surprised when I heard that she’d died at the Ritz, Piccadilly, not in Kesteven, wherever that is. Oh yes, I know where it is; it’s north of Milton Keynes. 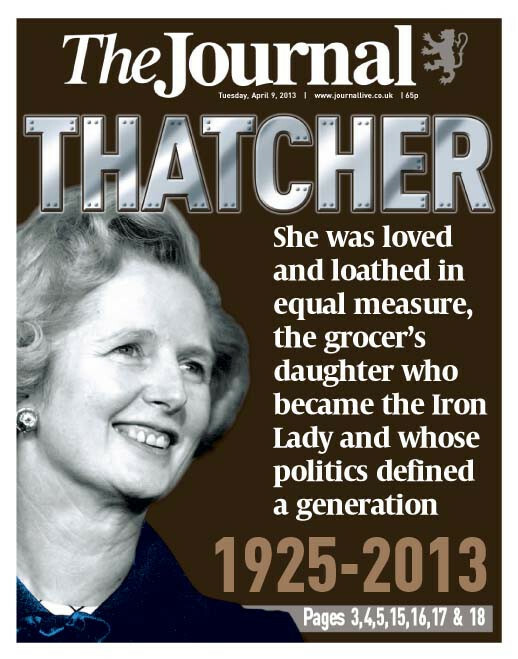 The small-town grocer’s daughter from somewhere up north was, much more than most of her kind in the upper reaches of the political class, a metropolitan big shot inhabiting a universe that stretches selectively from Highgate, Hampstead and Islington in the north to Westminster and Belgravia in the south and Hammersmith and Putney in the west. Its people holiday in Tuscany – sometimes at villas loaned by crooked Italian prime ministers – and New England. When these people have something to say, they say it first to the BBC, or ITN, or the Daily Mail, The Daily Telegraph and The Guardian. They used to say it also to The Sun, but perhaps not these days. They tend not contact first The Kesteven and Grantham Bugle or, foolishly, The Northern Echo. The House of Commons press lobby, however, offered a weekly opportunity to regional newspaper reporters to, as it were, get a look in. 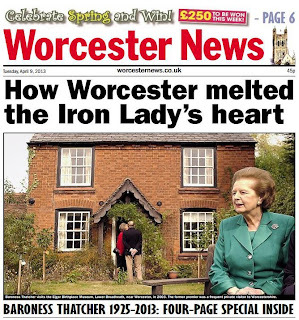 It was there as the Northern Echo’s political correspondent that I first met Mrs T who, like all opposition leaders and PMs took questions every Thursday from journalists at off-the-record meetings, sometimes in a small Commons’ attic, sometimes at No 10. 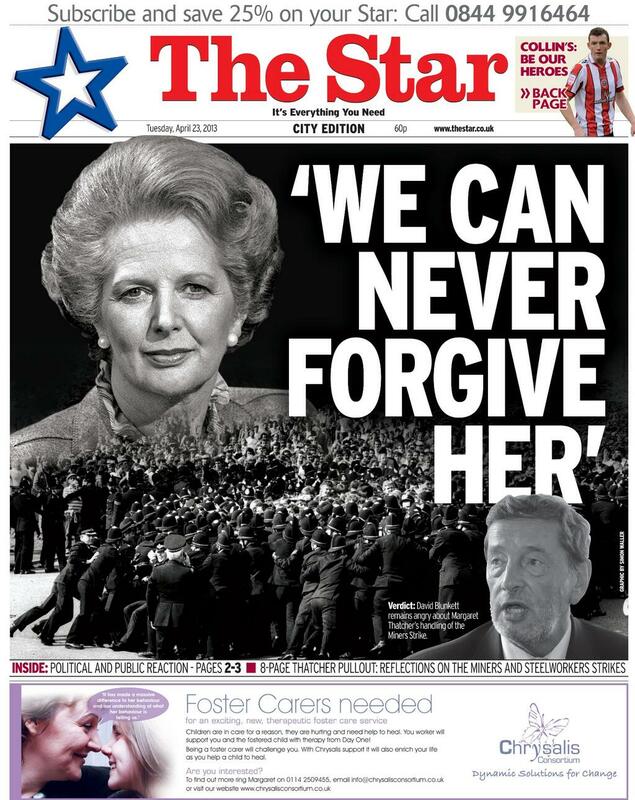 This was in the days before those troublesome gates were put across Downing Street. I can’t remember if Mrs T was then opposition leader or PM, but it didn’t matter; her response to my questions would have been much the same. I asked her what she thought of a speech to be made by John Nott – a senior Tory politician, who had thoughtfully given hacks advance copies. What speech is that, she asked. The speech in which he said the terms on which Britain had entered the Common Market – as the Belgian Empire was then known – were seriously damaging to the country’s trade. He doesn’t say that, she said, glowering. He does, I said. No, no, he doesn’t, she said. I read out a sentence from Nott’s speech. Well, that’s not how I interpret it, she said, still glowering. Next question! 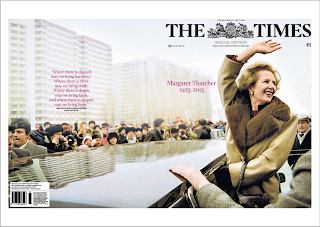 Mrs T was on the money when it came to the Soviet threat, but very slow to understand – until it was too late for her to do anything about it – what the Common Market was all about. 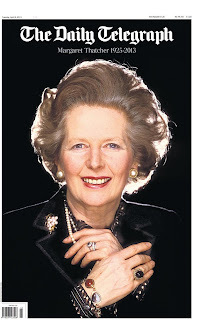 She liberated the Falkland Islands, helped to hasten the collapse of the Soviet Union and got some of our money back from Brussels, but she shoved the Single European Act through Parliament. 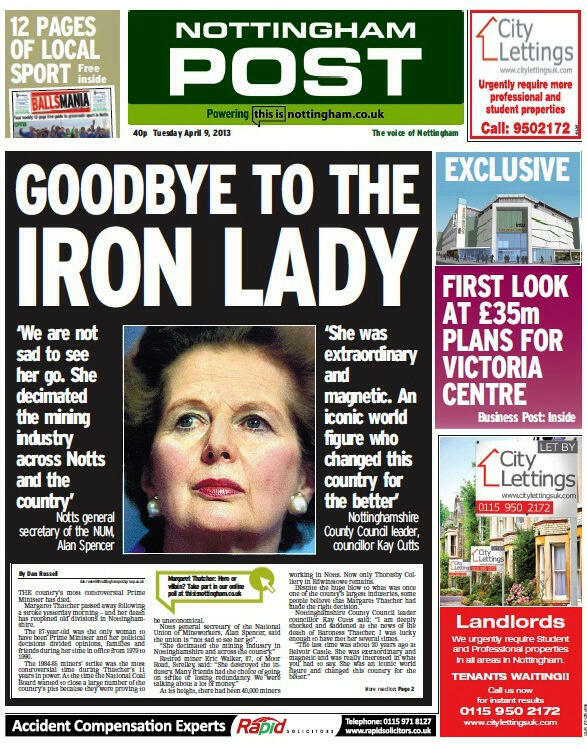 She appeared to be under the impression then that the European project was just about the free movement of Polish plumbers and Italian white goods. 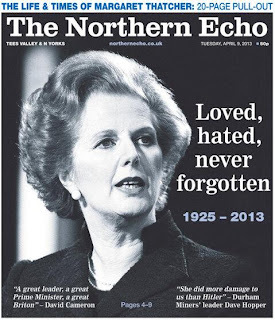 I met her again a few years later, when I was deputy editor of The Northern Echo. I took a call from a big shot at the Conservative Party’s HQ in London. He asked for the editor. 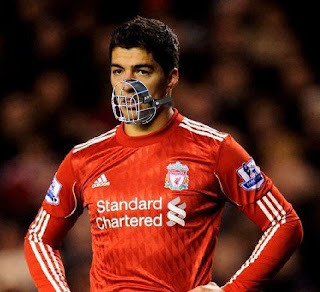 He’s on holiday, I said. Who are you? 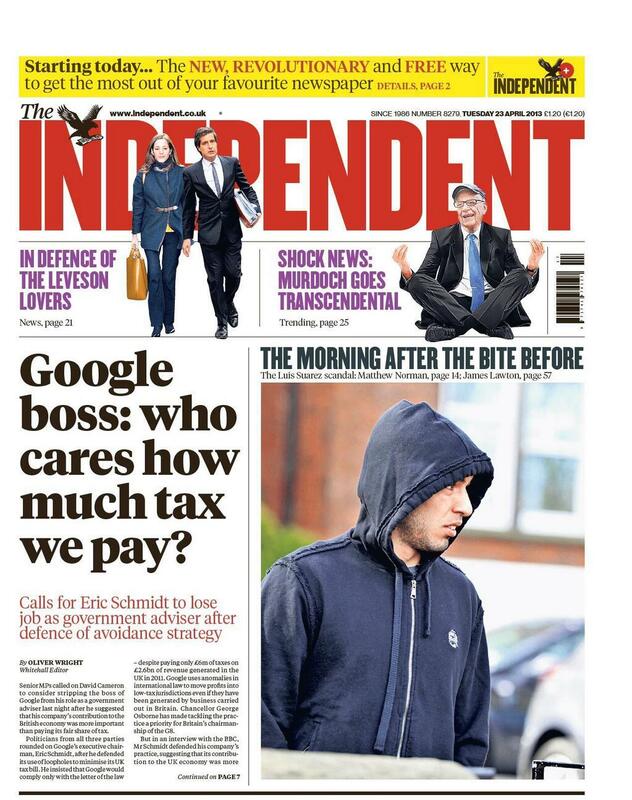 The deputy editor, I said. 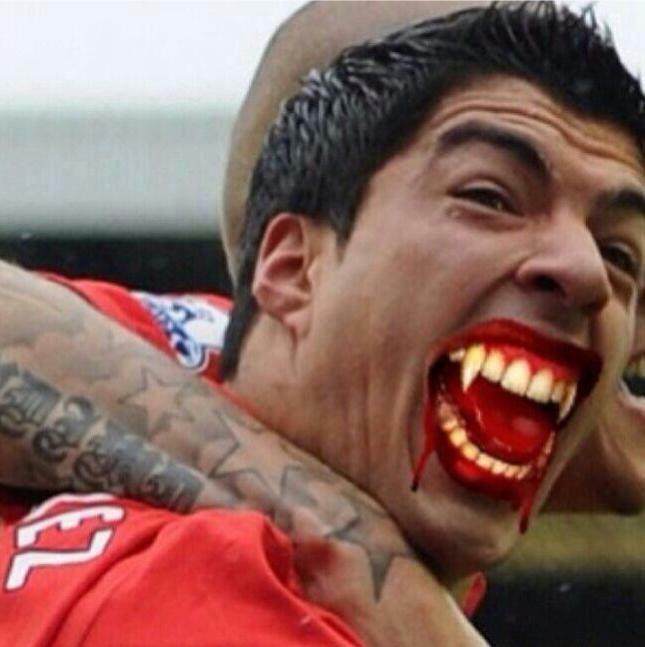 Right, he said, I’m phoning to ask if you’d like to attend a dinner in Newcastle tomorrow evening. Your host will be a VIP. I asked for the name of this VIP. He said he couldn’t tell me. Why not, I asked. Security, he said. 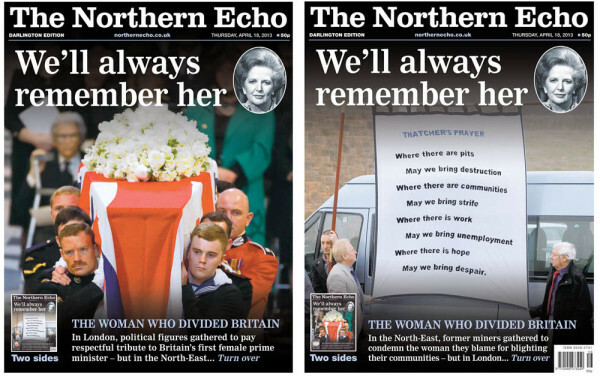 I pointed out that The Northern Echo was a morning paper, which meant I normally had to be there at night. 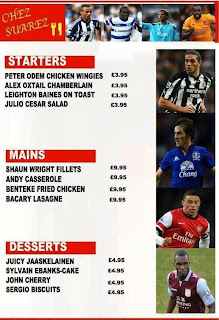 I couldn’t take the risk of going to a dinner in Newcastle to find the VIP wasn’t my idea of a VIP. 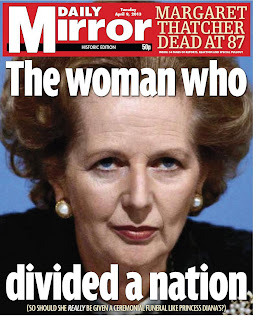 Was it Mrs Thatcher? Couldn’t possibly tell you, old boy! I said I’d be there. This VIP, said the big shot, wanted to hear the opinions of opinion-formers in the North East. I wasn’t sure that I was an opinion-former – I didn’t have a certificate for it – but I very much doubted that hearing my opinions or those of colleagues in the region was what she wanted to do. I was right. There were ten or 12 of us, journalists from NE newspapers, TV and radio stations. She greeted us warmly as we walked into the dining room. Haven’t I seen you before, she asked me. Yes, I worked at the Commons. 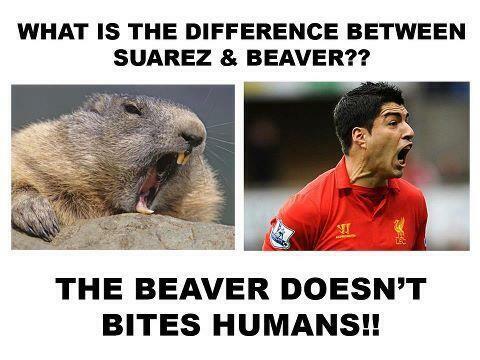 Oh yes, that’s right. What brought you up here, David? Do have a drink! My place at the table was directly opposite hers. The dinner was good – beef, lamb, something like that, and fine claret. The talk was small until we reached the coffee and chocs stage. 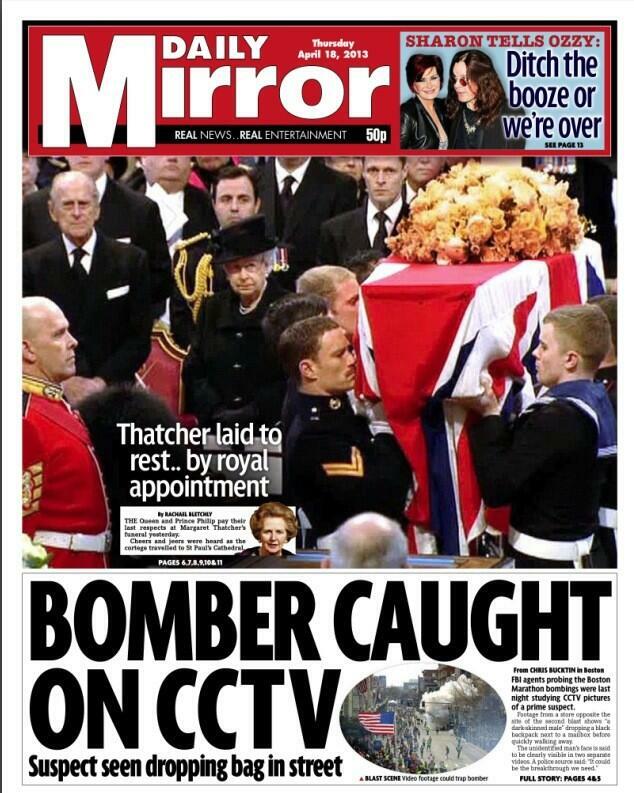 The Government, she said, was having a problem getting its message across in the North-East. How did we think it could do better. A little time was wasted as some of my colleagues tried to explain to her that the Government’s policies were wrecking what was left of the region’s industry. She showed no sign of being interested in the opinions of my fellow opinion-formers. I got the glower, up close and personal. “I’m not,” I interrupted, “on anyone’s side. I don’t support any party.” It was true; I didn’t. I could have been speaking Mandarin Chinese. It was clear that I what I said was incomprehensible to her. 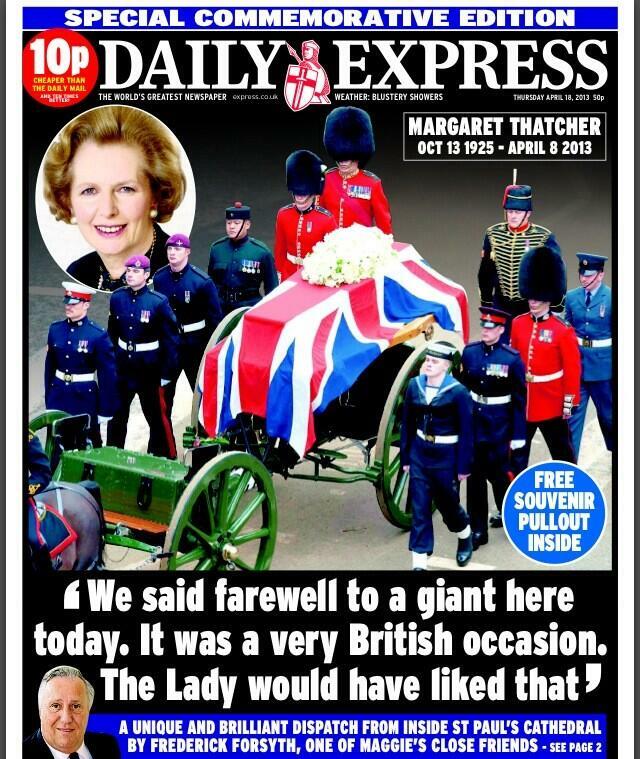 Much of what has been said about her this past week by her friends and foes alike has been claptrap. She was not a self-made woman. Marrying a millionaire was hardly an obstruction in the pursuit of her career goals. 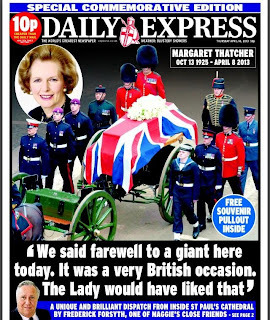 She was not uncaring and arrogant; she was kind and polite, unlike some on the Left – and in the middle – who claim in public to be champions of the people but who in private view them with contempt. She was not a witch. Yes, she knew her own mind, but was not greatly interested in the minds of others. 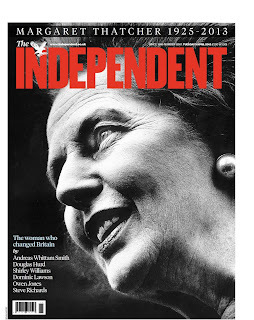 I still, after all these years, don’t support a political party, but looking back, and looking at what’s on offer these days, I give her one-and-a-half cheers. Footnote: Those of you familiar with the history of The Northern Echo might know it has never had an editor by the name of David Kernek. Kernek is in fact David Flintham. This is the story in a par: He was adopted as a baby, when his surname was changed to that of his adoptive parents. In the 1990s, he traced his natural mother - a refugee from Nazi-occupied Austria - and later changed his name back to Kernek. What's in a name? Everything and nothing, he says. A great friend indeed. But also very humble. 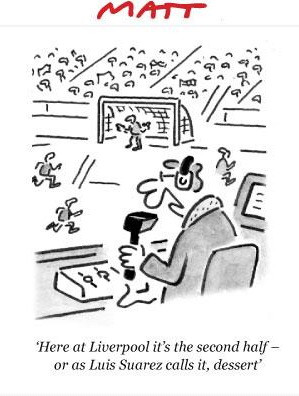 One of my strongest memories of Mel was the day he was appointed editor in Scunthorpe. Mel was already an experienced journalist, yet he insisted on driving 300 miles, down to Essex, to pick my brain about his new job. That was the measure of the man. Never too proud to ask. Always eager to learn. Of course, Mel spent much of his career teaching other journalists – particularly production journalists – how to do their jobs. 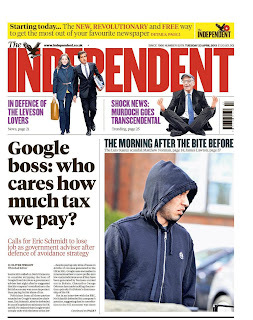 I remember, in Wales, him trying to persuade one sub editor that every photograph had to be given a unique name, otherwise the new computer system might publish the wrong picture. Mel only realised he'd failed when he opened the following day's paper and saw a feature about the solar system... illustrated with an eight-column picture of a Mars bar! Yes. There was never a dull moment when Mel was around. So you see Mel was a very special individual, who will be sorely missed. 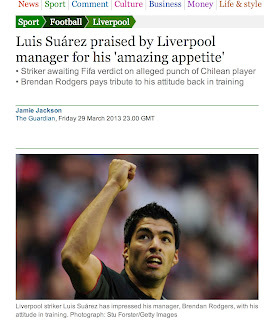 People loved him. Sometimes it was the small things, like leaving bags of joke sweets – full of salt and pepper – lying around Mike Norton's desk. Because he just knew that Knocker Norton would not be able to resist taking a handful. It worked every time. Then there were the astonishingly annoying Star Ship Enterprise noises that he downloaded on to Richard Bowyer's keyboard – and refused to show anyone how to remove. 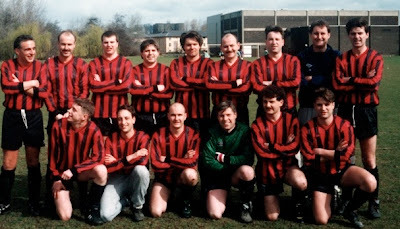 But my final, favourite memory of Melly Mel was of the South Wales Echo football tour he organised to France. This was the day on which all his victims had their retribution. During a civic reception, in front of 500 guests, we secretly arranged for Mel to be invited onto the stage by the Mayor. 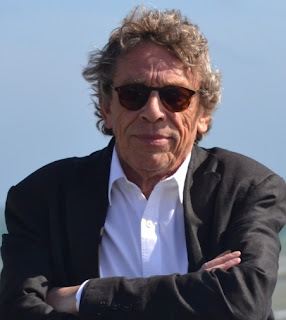 With trumpets sounding, Mel was accepted as an honorary member of the Ancient Order of The Chevalier – The Gallic Freemasonry of French Musketeers. I will never forget the look on Mel's face as a floppy D'Artagnan hat – complete with three-foot feather – was placed on his head. 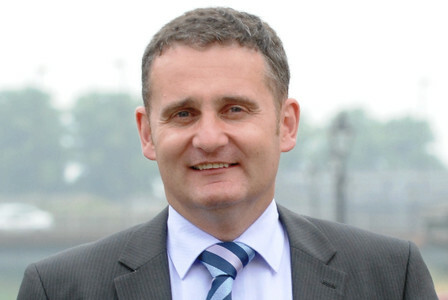 The Mayor of Nantes announced: "We are proud to welcome Monsieur Melvyn Cook – the finest hairdresser in all of Wales!" Mel stepped up to the microphone, straightened his tie and said: "Thanks lads!" No Mel. Thank you. Thank you for being such a generous, kind, happy fella. And for being our friend. Here's to Mel. After the funeral we all raised a glass to Mel at his favourite drinking den, Brown's Bistro in his village of Fernwood. This is a picture that Mel would have loved. It shows me, Keith Perch, Richard Bowyer, John Meehan, Mike Norton, Mike Sassi, Alan Geere, Steve Hall and Simon O'Neill with a framed photograph of Mel and his partner Helen. 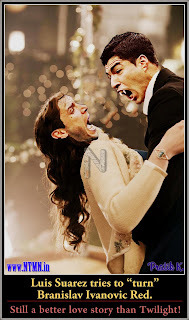 They are typical of the stories about Mel, told with warmth and real affection. Here are a couple of other tributes, from two of his former editors. The Derby Evening Telegraph newsroom of the early 1990s was a place of remarkable talents - Keith Perch, Simon O'Neill, Kevin Booth, Steve Hall, Mike Sassi, Richard Bowyer, Simon Irwin, Jeremy Clifford - all of whom went on to great things. At the heart of this powerhouse, as chief sub, was Mel Cook. Mel held it all together when things were in danger of spinning out of control. When an editor was making unreasonable demands or when the newsdesk wanted just five more minutes more, Mel was completely unflappable and utterly professional. And he met those unreasonable demands and he found those five more minutes. His sense of humour and positive attitude to life enhanced everyone's working day. His daily jousting with Boothy, our news editor, so often released the steam on the pressure cooker. 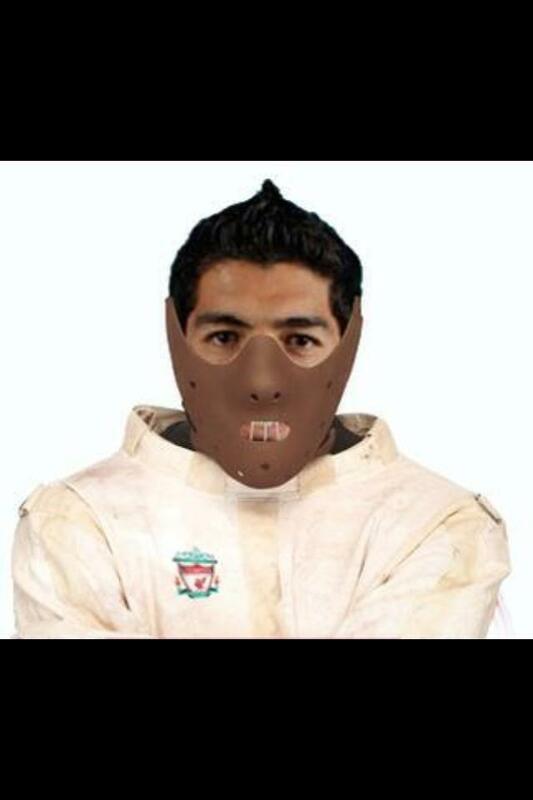 He was always the one responsible for the latest practical joke. 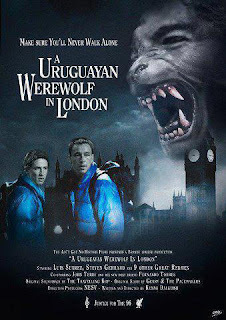 On rowdy football tours or for an hour down the pub, he was delightful company. He was a great friend and colleague and will be missed by all who were lucky enough to meet him. We once faced the challenge of a very talented young reporter who had become disenchanted and had given in his notice. We were determined to persuade him to stay. I saw him but failed completely to change his mind. 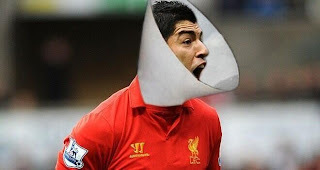 I knew there was only one person who could turn this around - Mel. 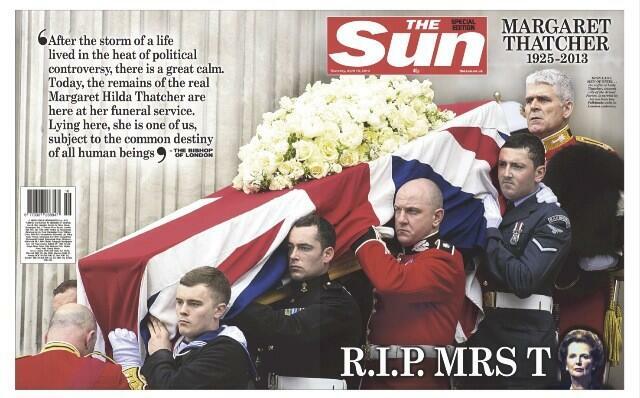 With his cheery, eternally positive nature, Mel was a master of motivating journalists. He decided a heart-to-heart with 'Uncle Mel' was required and he took the young reporter out for a liquid lunch to an Irish bar near the office. Trouble was, unknown to Mel, the bar had recently become a lurid gay meeting place. The change was not obvious from outside, but inside it was dramatically different in 'ambience'. The lunchtime motivational session took place amid much interest in Mel - at the time sporting a moustache that would not have been out of place on one of the Village People - and his fresh-faced companion. The unusual setting worked a trick. 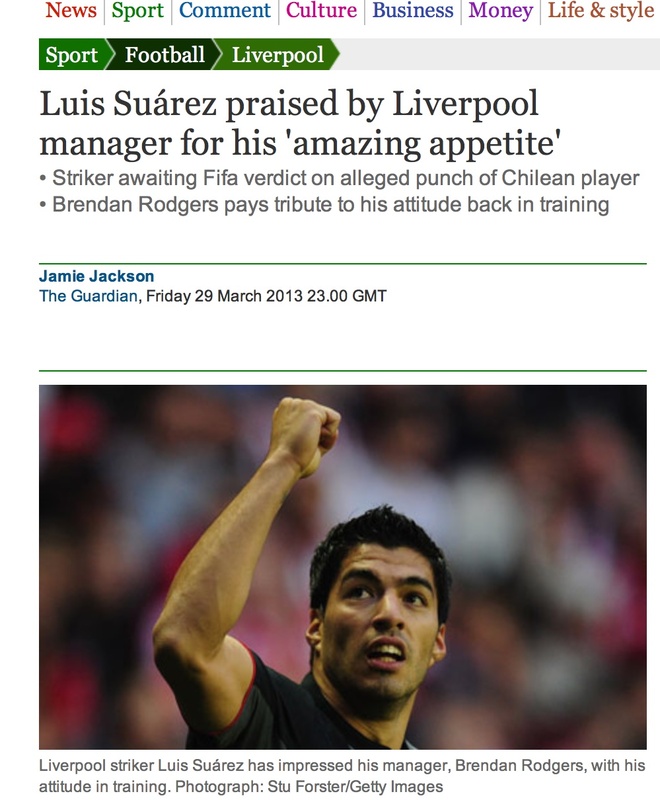 The young reporter came back with a great story and all was right with the world. As ever, Mel also revelled in telling the story against himself. 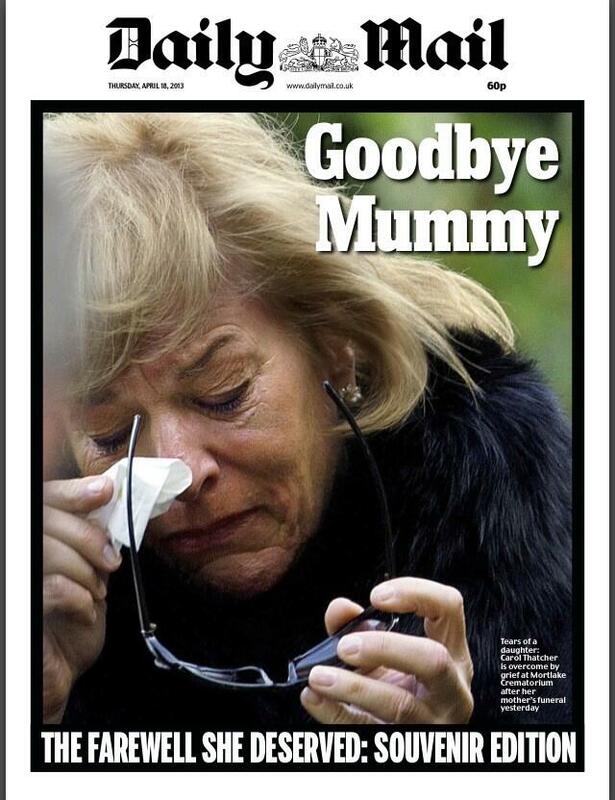 Humour, warmth and kindness were clearly a huge part of Mel's personality. 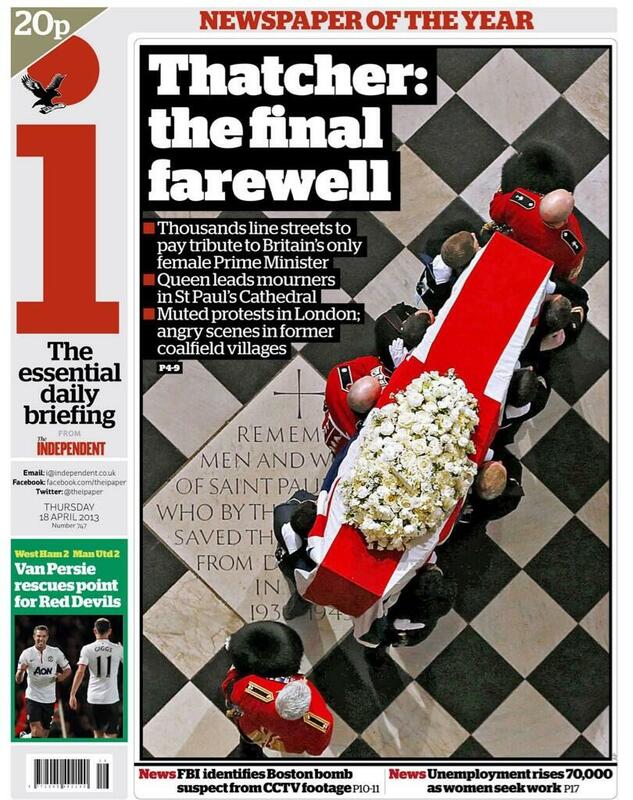 There are some poignant comments about him on Hold The Front Page that illustrate what people truly thought of him. Mel was a first rate journalist and editor, a great father and family-man, a talented sportsman and a musician and comic who fronted the Yorkshire punk band, the Padlock Sisters. He was also one of the most positive people you could ever meet. When he was diagnosed last October, he was having none of it. He tackled it head-on, refusing to be anything but positive for those around him. He and his partner Helen created a 'wall of positivity' in their home - filled with messages, cards, mock front pages and memories. 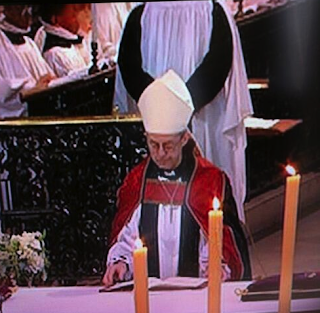 It gave him and those who visited him an enormous amount of joy. Mel's journalism career started at Pontefract and Castleford Express and took in the Derby Evening Telegraph and South Wales Echo before he was appointed deputy editor at the Hull Daily Mail. 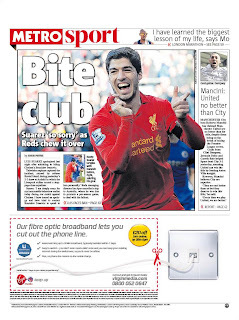 He moved to the Scunthorpe Telegraph as editor and did a first rate job of taking the paper weekly in 2011. He was appointed editor of the Nottingham Post in May last year. He will, of course, be missed terribly by his family, including his daughter Ellie, his partner Helen and her son Luke, and by his friends and colleagues … but we will all cherish his memory and be grateful we had the privilege to know him. Among the regional newspaper cast of thousands in the church yesterday were Mike Sassi and Richard Bowyer from the Sentinel; Simon O'Neill, editor of the Oxford Mail; Mike Norton, editor of the Bristol Post; former Leicester Mercury editor Keith Perch; former Hull Daily Mail editor John Meehan and deputy Paul Hartley; the executive team from the Nottingham Post including Steve Hollingsworth, Alan Geere and Charlie Walker; Steve Hall, MD at the Derby Telegraph; Mike Lowe, editor of Costwold Life; Kevin Booth, editor of the Burton Mail; Michelle Lalor, editor at the Grimsby Telegraph; Jeremy Clifford, editor at the Star in Sheffield; Dave Atkin, editor at the Scunthorpe Telegraph, Jon Grubb, former editor of the Lincolnshire Echo; Local World chief executive Steve Auckland and executive director Rich Mead; media lawyer Tony Jaffa; former editor of the South Wales Echo, Robin Fletcher; former editor of the Retford Times, Nick Purkiss amd former Grimsby Telegraph MD Mark Price. These are just a few of the people I caught up with. There were dozens of other journalists (if I missed you out, please forgive me) and of course countless other friends and family. It was a great tribute to a great man. 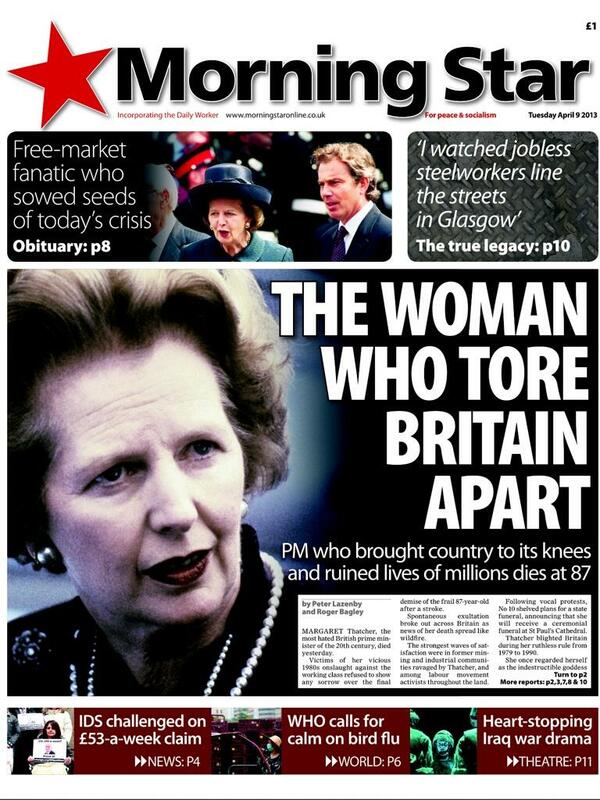 Today's front pages illustrate perfectly what Britain really thought of Margaret Thatcher. There was no middle ground. It was either love or hate. I spent all of her Downing Street tenure working as a journalist in the North-East. I reported on what happened to the mining communities in the 80s, watched the way the working class values I had been brought up with were brushed aside and saw the region largely ignored by government. 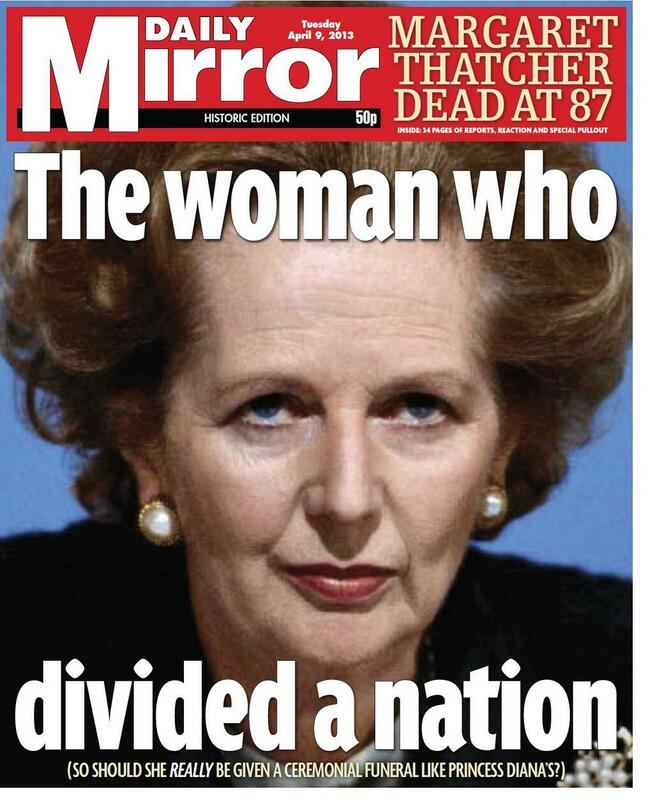 It is fair to say in that corner of England she was more loathed than loved. 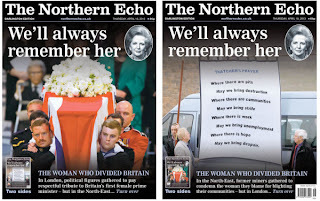 The Northern Echo that I worked on, certainly took a position against many of her policies but it would never have rejoiced in the death of an old lady. 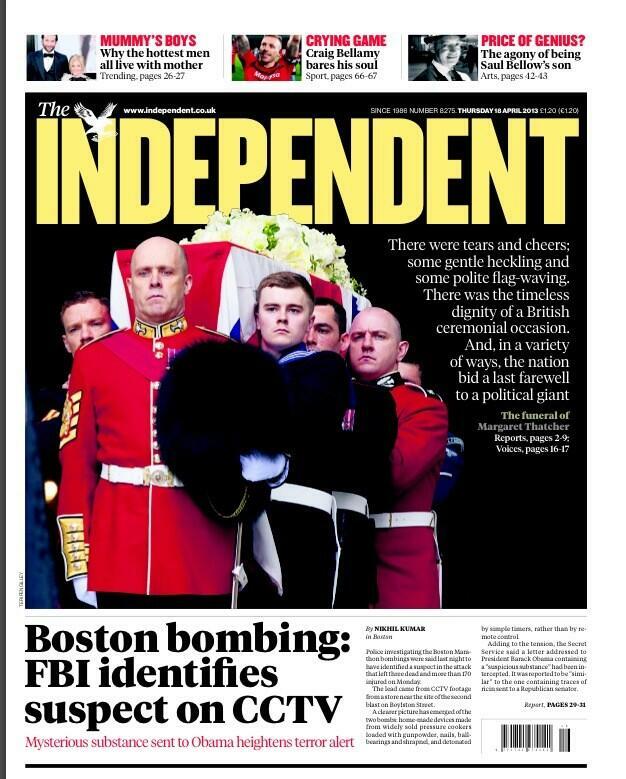 So well done to Peter Barron and his team for a first-rate and balanced front page. 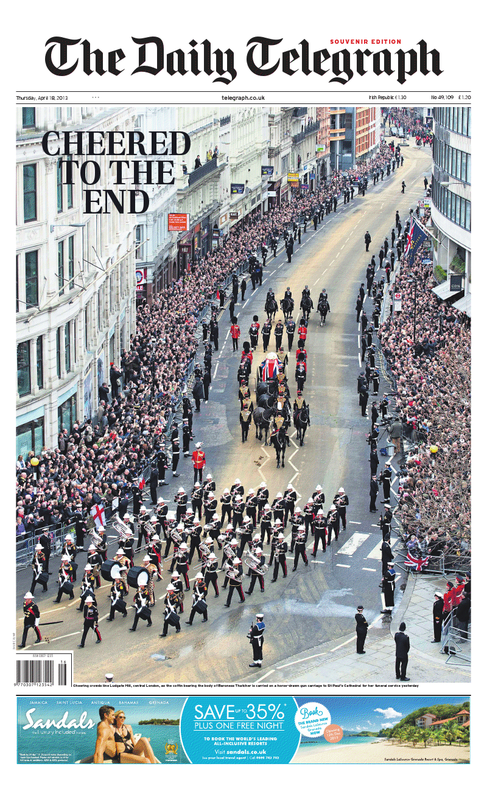 Like many papers, the Echo has gone for a stark black and white image. 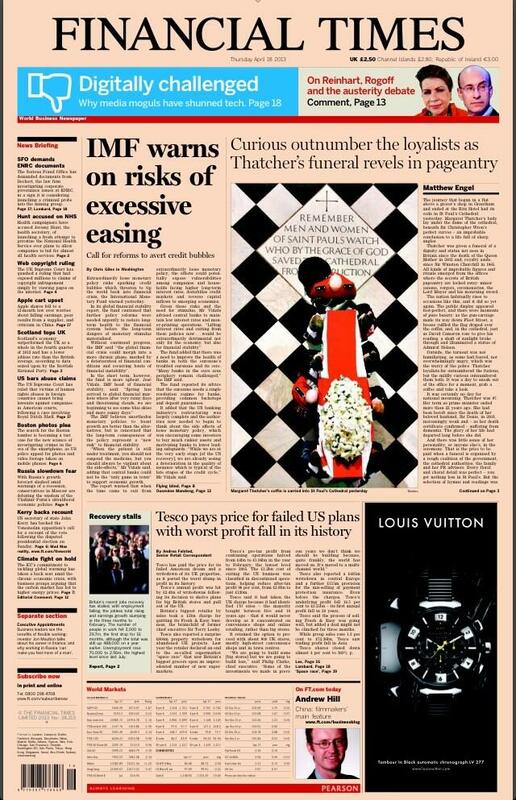 The three-deck quotes across the bottom show just how Thatcher polarised opinion. 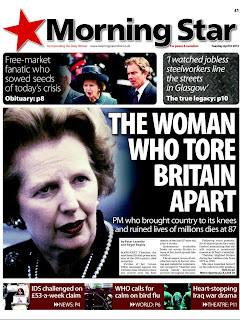 David Cameron's 'a great leader, a great Prime Minister, a great Briton' is countered brilliantly by the words of Durham miners' leader Dave Hopper: 'She did more damage to us than Hitler.' 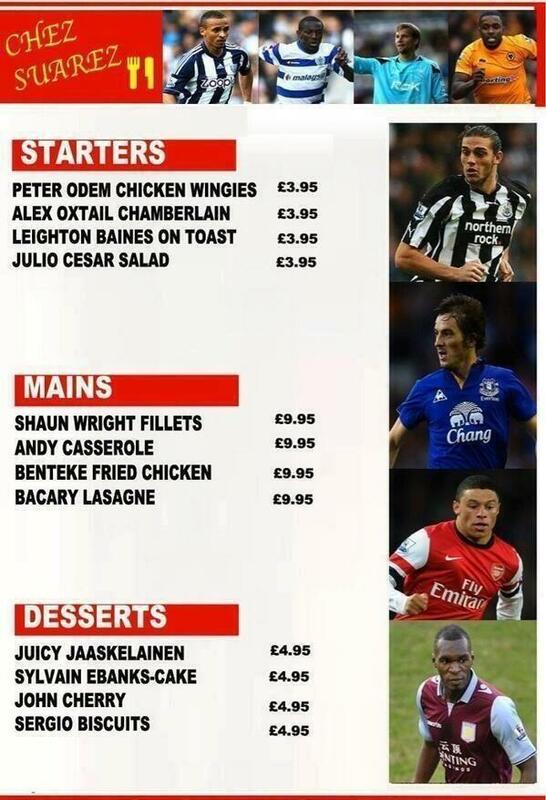 Sums it up really. The Journal in Newcastle also goes for a black and white image - although a more sympathetic choice - and takes the 'loved and loathed in equal measure' angle. 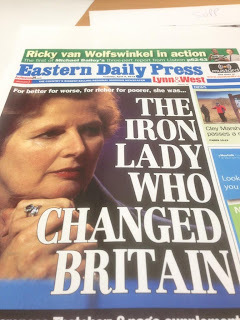 Note the metallic headline - as in Iron Lady. 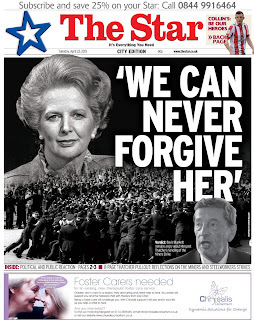 The Star in Sheffield, also in black and white, takes a more bullish line. It shows a picture from the Battle of Orgreave in 1984 when a mass picket of miners was met with a massive body of police officers - a brutal and violent confrontation. Memories run deep in the mining communities and The Star reflects that. It wasn't just the Northern mining communities that were affected by the pit closures. 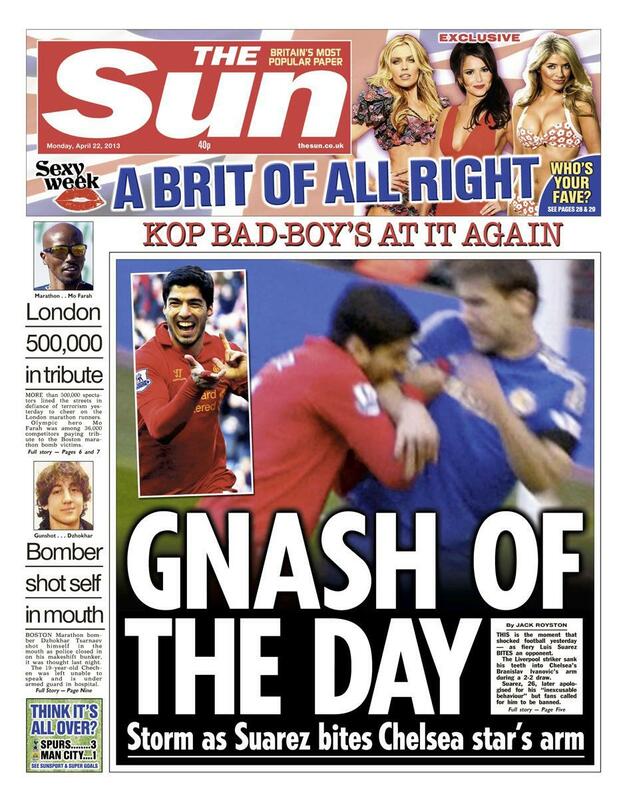 Wales was also hit badly. 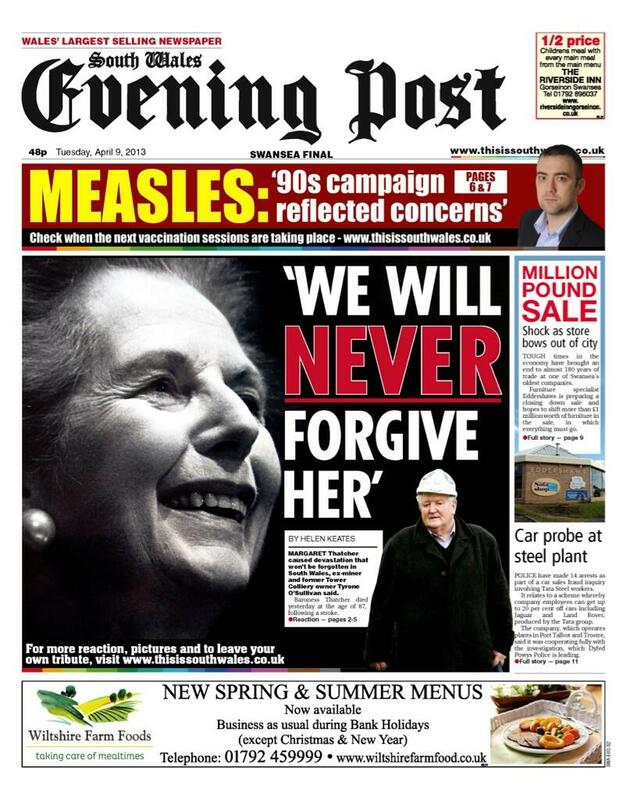 The South Wales Evening Post reflects the view of the majority of its readers - that Wales will also never forgive her. The Western Mail also recognises that it is what Thatcher did to the mining industry that she will be remembered for. 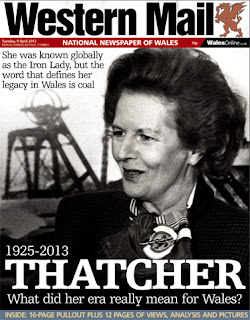 The word that defines her legacy in Wales is coal. 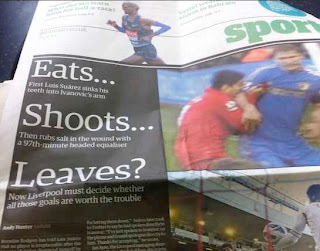 The Nottingham Post also covers a mining area - but strives for balance. 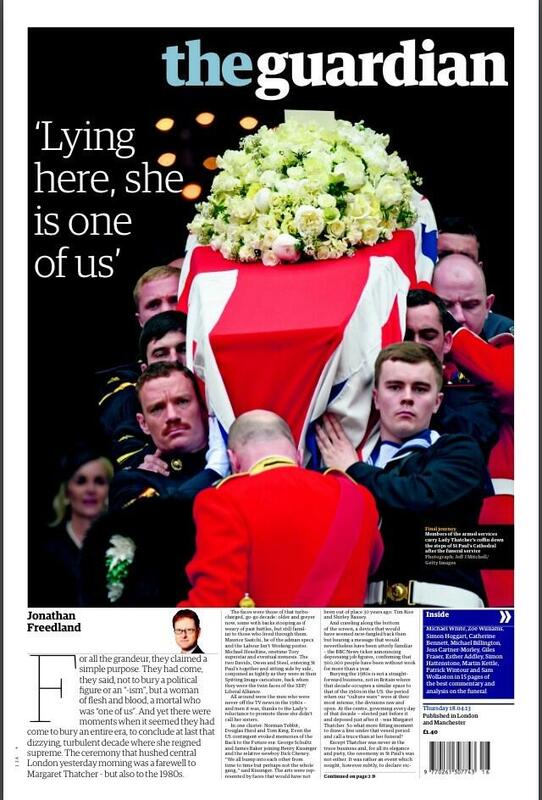 The paper goes for a straight headline but the quote 'we are not sorry to see her go' no doubt reflects the view of many of its readers. 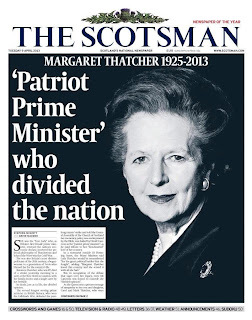 The Scotsman also goes with a black and white image, perhaps a little more sympathetic than those chosen by The Northern Echo and the Sheffield Star, and concludes that she divided the nation. No doubt about that. Elsewhere in the regions there are more positive stances. 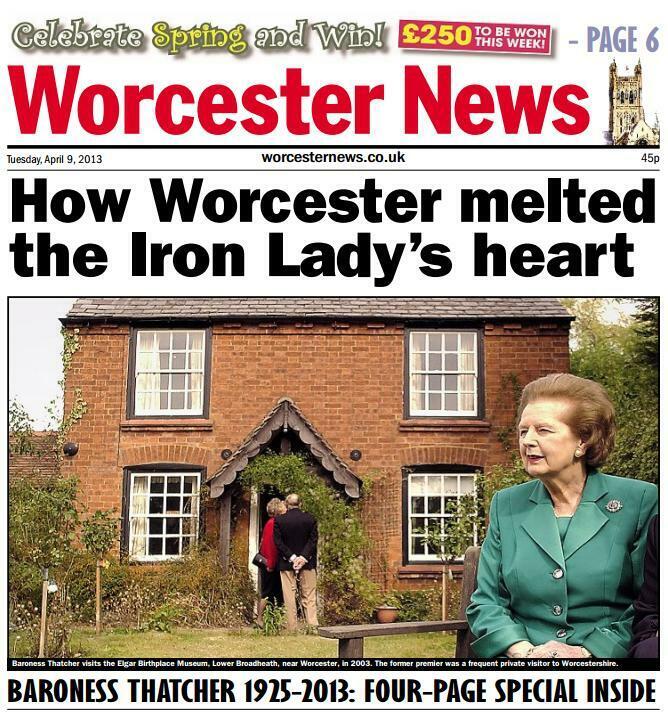 The Worcester News goes for the former PM's relationship with Worcester ... and uses a picture of her visiting the Elgar Birthplace Museum. 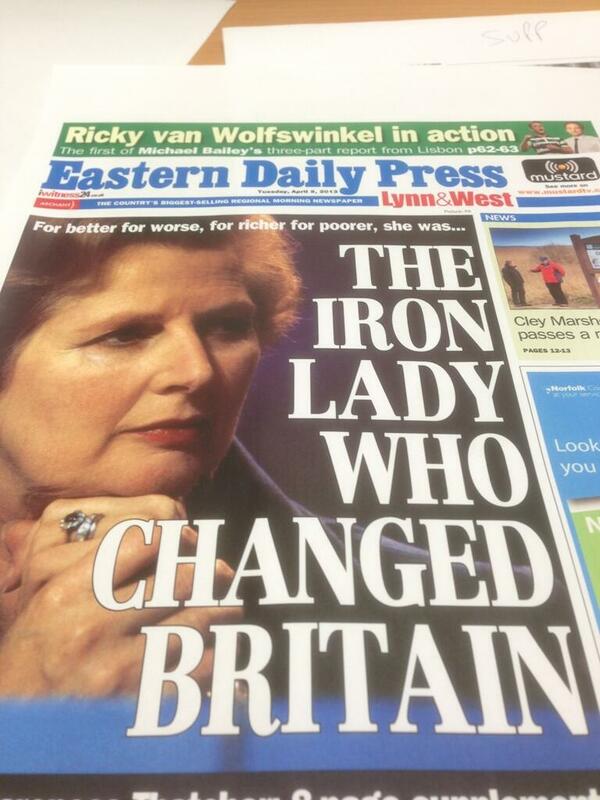 Meanwhile the Eastern Daily Press opts for colour and a straight headline. Over on the nationals, the most positive position is, not surprisingly, taken by the Daily Mail. 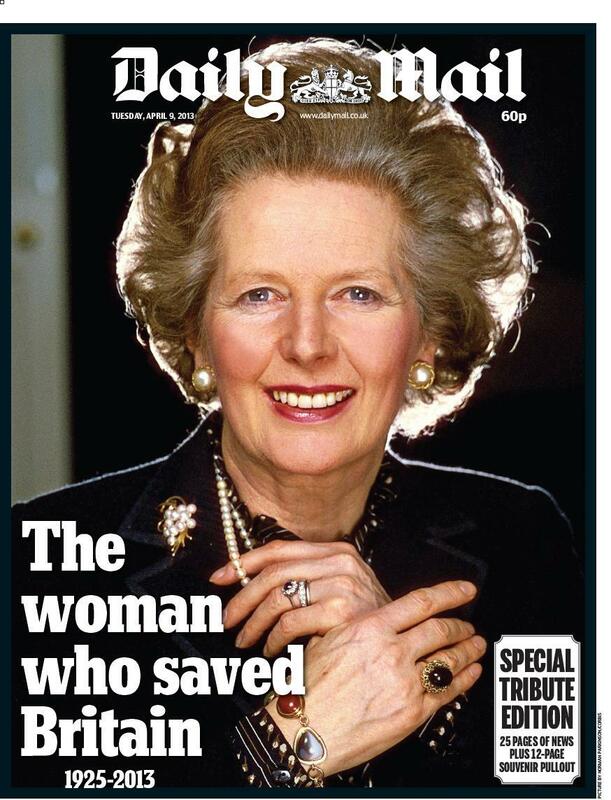 Not the woman who divided Britain or changed Britain ... but the woman who saved Britain. 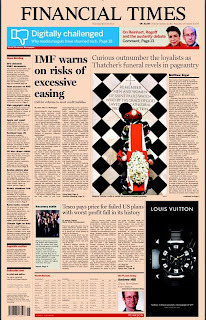 The choice of picture also portrays a softer tone. 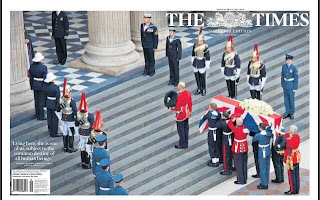 The same back-lit picture wipes out the front of The Daily Telegraph to create a dignified and subtle front which requires no headline. 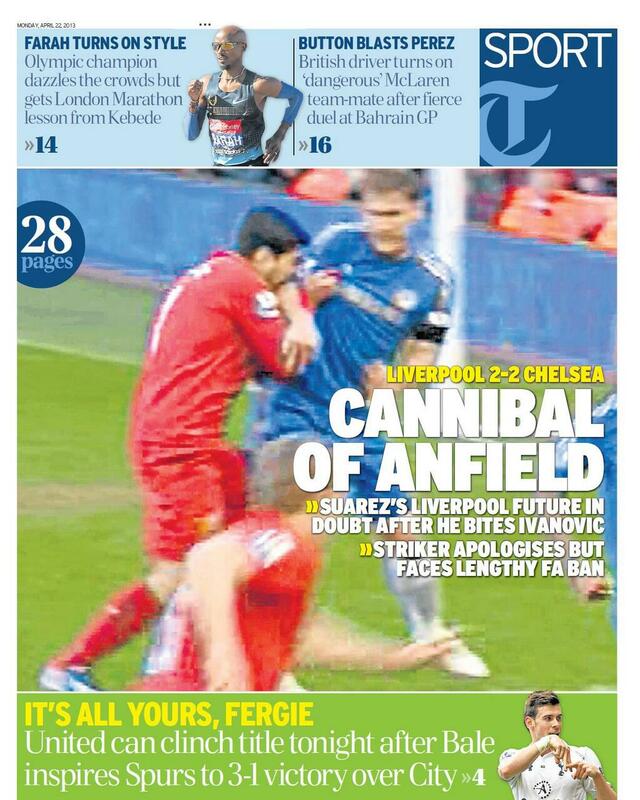 The Times takes a different stance from everyone else. 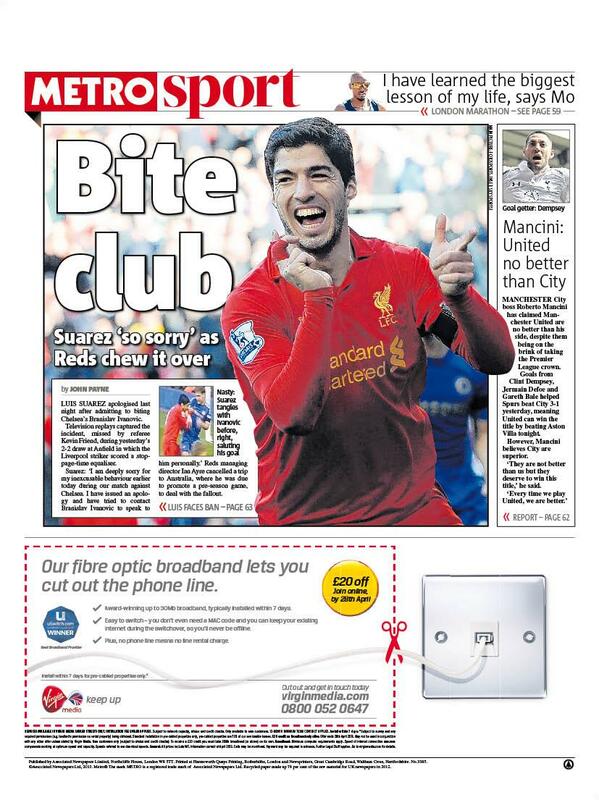 Having opted for one of its trademark wraparounds it needs a horizontal photograph. 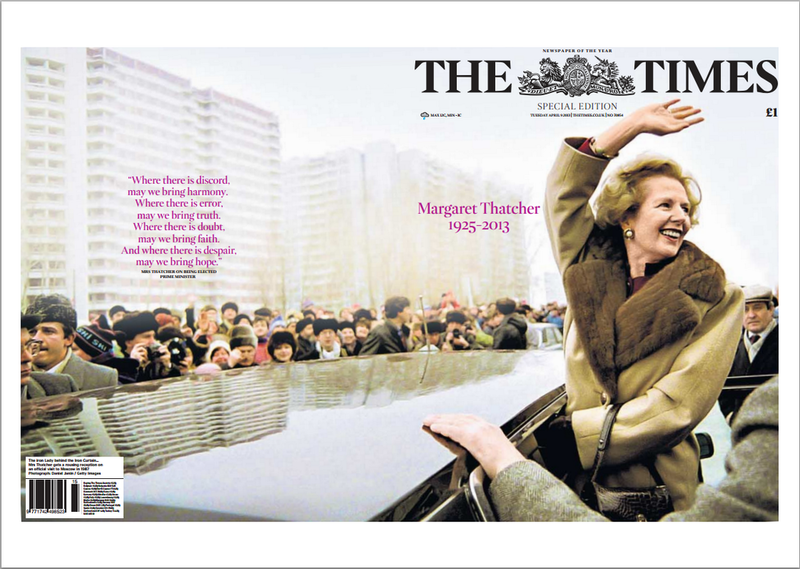 It selects one of a triumphant Thatcher in Moscow and angles in on her role in the dismantling of the Eastern Bloc. 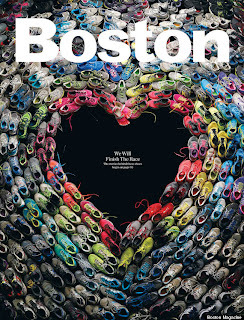 Good concept ... and strong front page. But on the day of the death of a former Prime Minister, you might think it an odd decision to take over the back page with a car roof, tower blocks and forlorn people in fur hats. 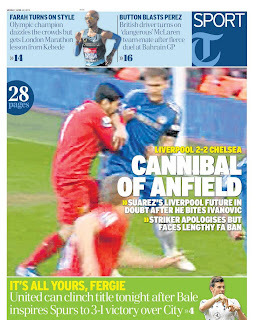 Inside the wrap, the paper plays it straight with an archetypal picture and factual headline. 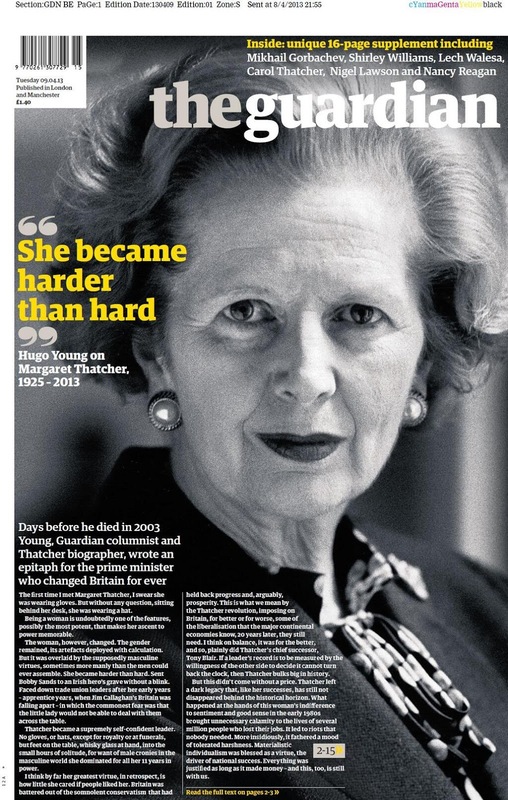 Like many of the regional papers The Guardian goes for a severe black and white portrait to illustrate a Hugo Young epitaph, written in 2003. 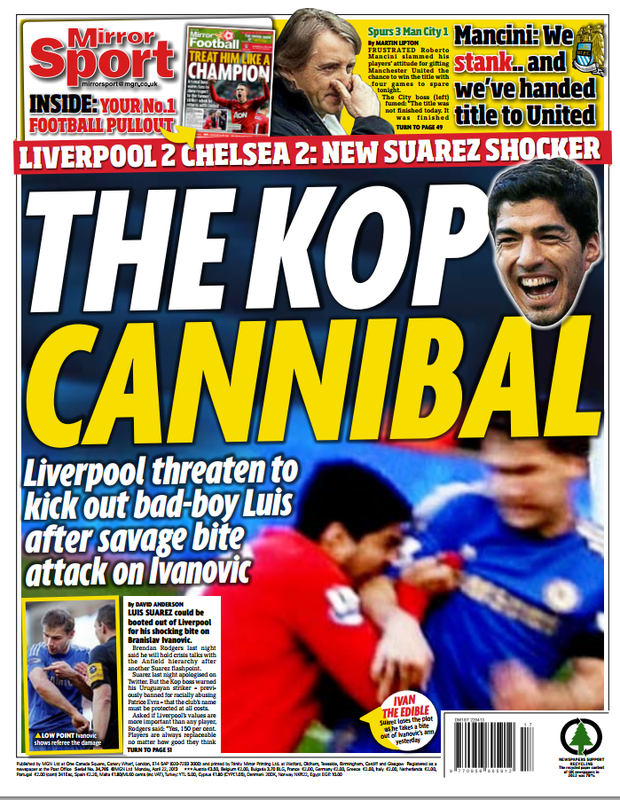 Interesting use of a yellow headline. 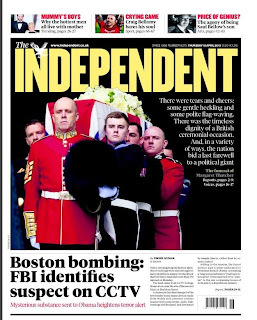 The Independent also goes for a black and white picture. With its tilted crop, gaunt face and staring eyes it is, perhaps, the starkest of them all. 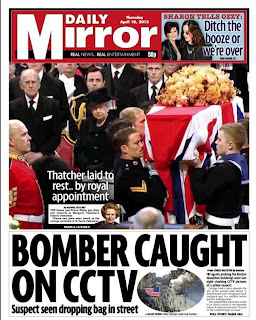 The Daily Mirror plays it pretty straight - with a sub deck questioning whether the woman who divided a nation should really be given a ceremonial funeral. 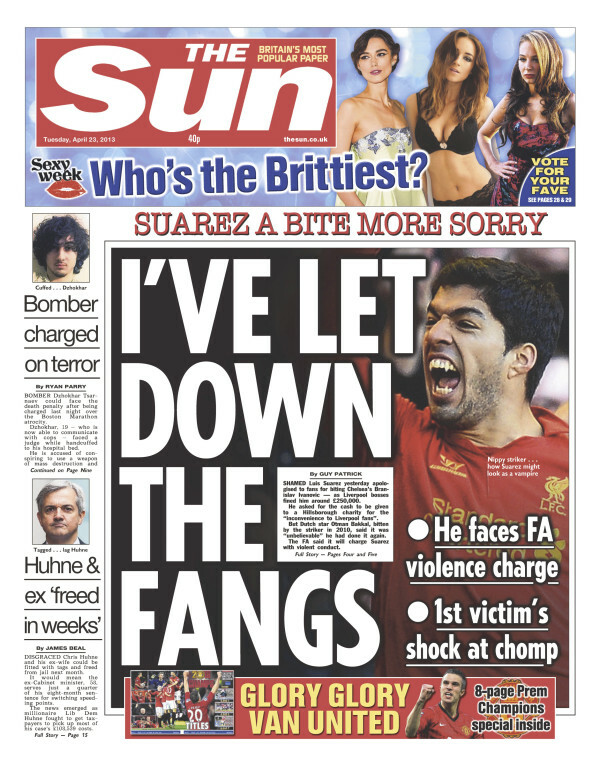 Meanwhile, The Sun takes the oddest angle of all. 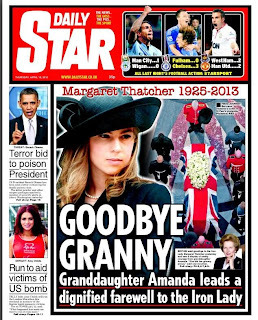 Forget the tributes, just tell it like any other tabloid tale. 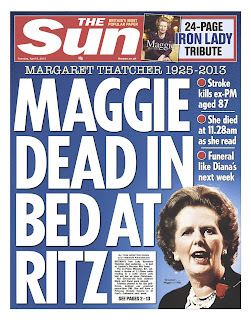 They could have gone all the way with the rhyming headline ... Maggie dead as she read in bed ... but I guess Ritz is such a compelling word. Not what I was expecting. 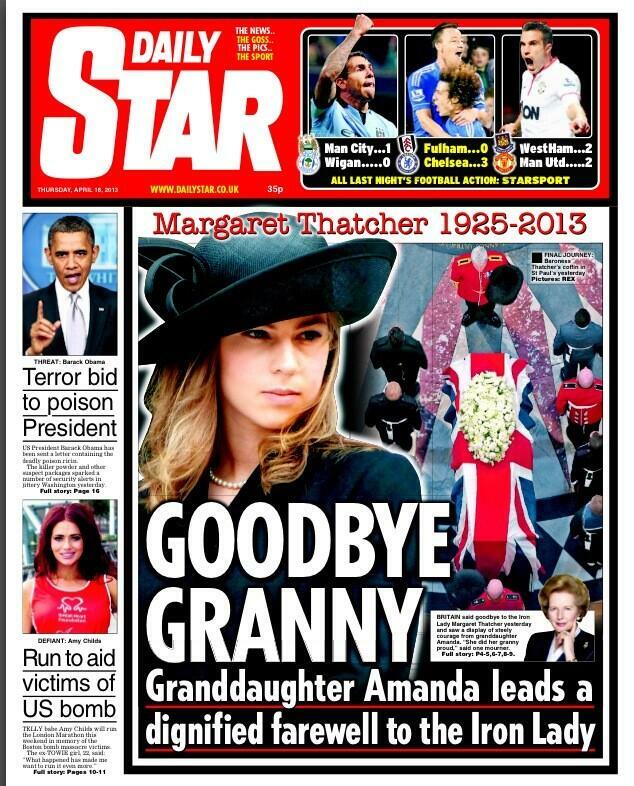 Much more predictable, over on the Left, the Morning Star is pretty forthright. 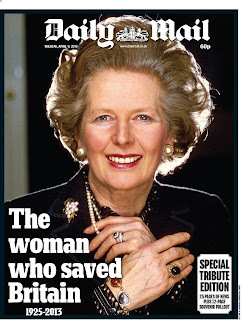 Compare the headline 'The woman who tore Britain apart' to that of the Daily Mail's 'The woman who saved Britain' ... and you have a synopsis of Margaret Thatcher's 11-year premiership in a nutshell. 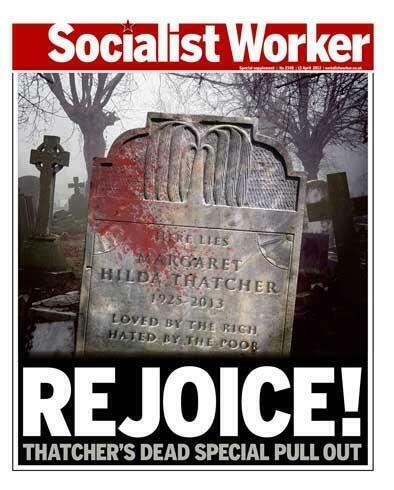 Nobody on the anti-Thatcher side, though, is quite as brutal as the Socialist Worker. Splattered blood on a grave? The depth of hatred is demonstrated by the fact that a newspaper really believes it is justified to report the death of an 87-year-old woman in such a way. Finally, here is a snapshot of the Left's view from abroad. France's Liberation simply labels Margaret Thatcher La grande faucheuse ... the grim reaper.